Govinda's had opened their Jumeirah outlet a few months ago and I had heard it's great but hadn't yet got a chance to go there until this day. A friend's acquaintance invited my here to try out their food. Compared to their other outlet which is in Bur Dubai, this is posh and has a lot more options to choose from. They have a lot of fusion food and healthy options too. We started with pani puri shots. 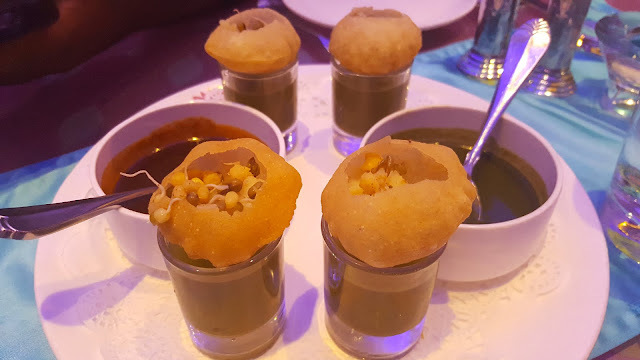 Our usual Indian street food - served in shots. The presentation (along with the creativity) stands out. The taste wasn't something exceptional. You can put the pani in the puri or have it after the puri as a shot. For starters, we had Malai Sheekh kebab which were really soft. Thanks to the malai I'm guessing. Now usually when one thinks of sheekh kebab, the word "vegetarian" isn't anywhere close by; but this vegetarian variant of the sheekh kebab was great. Along with that we called for some mocktails. Paradise, a thandai and Mango coconut. 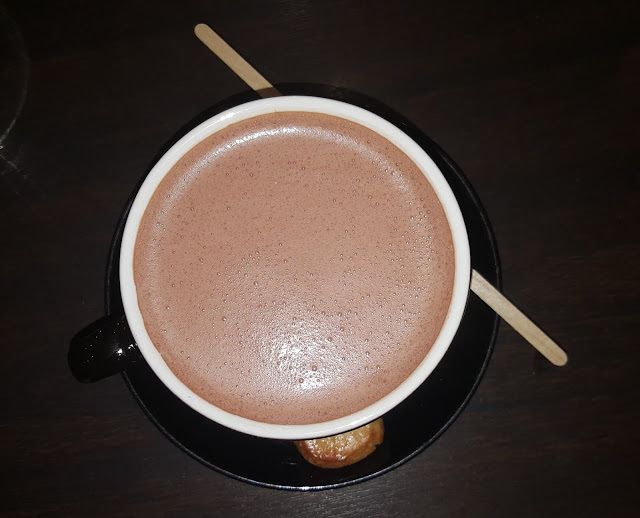 Nothing like sipping on some hot chocolate with a close buddy.